Eliminating and minimising risks is integral in any workplace, specifically in the body repairing industry. As a result, Pro-Visual Publishing, along with the Motor Traders Associations across Australia, has released the Body Repairers Guide to Workplace Safety 2015/16 to address the issues of spray painting and powder coating. It is apparent that chemicals, as well as noise and manual handling, pose a serious health hazard to operators since it is incorporated in the daily activities in the workplace. It is imperative to comply with the Work Health and Safety Act so all operators are well looked after. As a result of this, personal protective equipment and appropriate training is provided as necessary requirements. Ventilation systems installed in spray booths should be maintained regularly in order to ensure the safety in the workplace. This is integral to remove any airborne residue produced during spray painting, as well as to ensure the chemicals exposed in spray booths are properly controlled. Furthermore, it is important that proper procedures are communicated to the operators to reduce injuries and incidents. For example, spraying should not be performed above shoulder height when spraying a tall object. The solution is to use extension poles or lift platforms to complete the task successfully and safely. 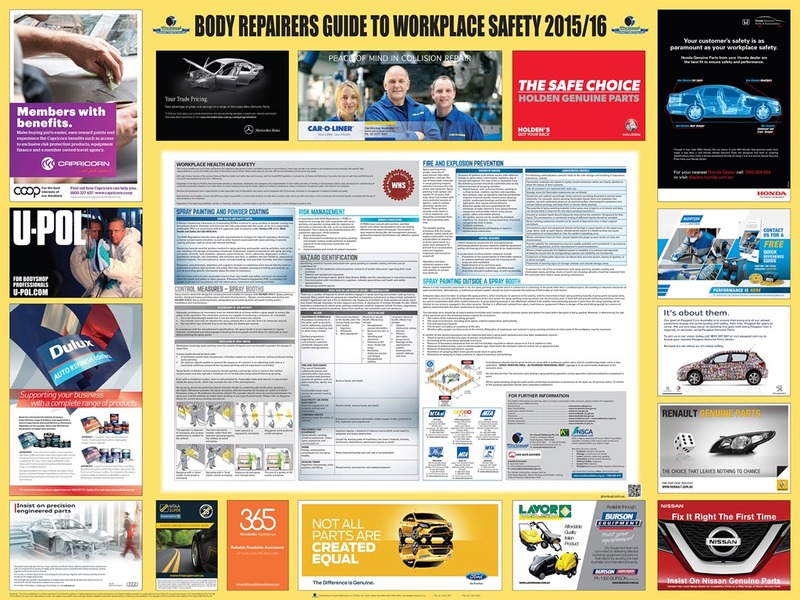 “I would like to thank all of the sponsors of the Body Repairers Guide to Workplace Safety 2015/16. Their support has made it possible for the Guide to be distributed free of charge” – John Hutchings, CEO, Pro-Visual Publishing.